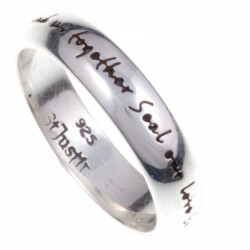 This classy sterling silver ring embodies perfectly true love and is a definite romantic present. British litterature features many love stories such as Romeo & Juliette: this ring is inspired from this 16th century romance and boasts eternal love.Engraved on the pendant, you may read : "Ring of love, bind us together. Seal our love, entwine us forever". The ring is delivered with a silver chain in a beautiful satin case. St Justin is based in Cornwall, a region of Great-Britain famous for its copper and tin mineral resources. St Justin still keeps alive Celtic legends reflected in its tin and silver jewellery. 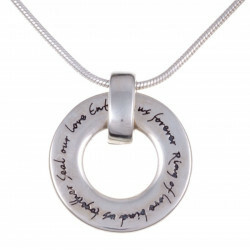 This elegant and romantic silver pendant embodies love. British litterature features many love stories such as Romeo & Juliette: this ring is inspired from this 16th century romance and boasts eternal love. Download our ring measurement set in PDF format to find out the size of your finger by clicking here.